I love this story and thought it was very topical with the Holiday season (I’m too scared/indoctrinated to actually use the word Christmas these days in fear of offending someone) right around the corner. In fact, I think we need more stories like this brought to our attention, not only at this time of year, but in general, to counter balance all the negative tripe the media shoves our way. Anyway, onto the positive stuff, a 16-year-old teen from North London has proven himself to be one of the savviest bargain shoppers around. As I LOVE a good bargain, I am in awe of this kid’s skills. He has earned himself the nickname the coupon kid for not only using a dizzying amount of discount vouchers when he goes grocery shopping (the fact that he even does the grocery shopping would make me bronze him if he were my son), but in this case, he has managed to buy £572 worth of food for a meager 4 pence. Yes, you read that right, FOUR pence. 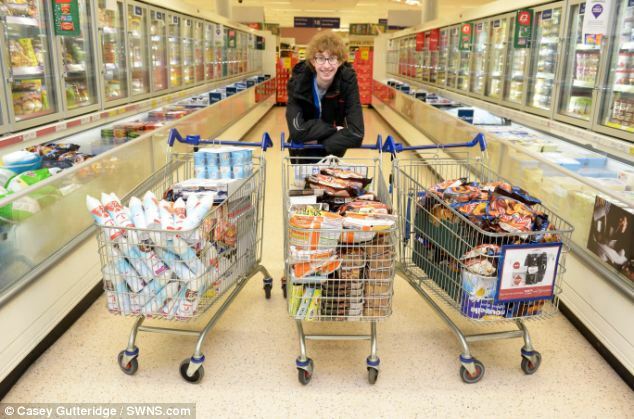 The best part, he then took the three trolleys filled with food and donated the lot to a charity that helps feed the homeless. God I love this kid. Apparently he spent hours a day searching newspapers and the internet for the best deals on food items, specifically those items people like to eat at Christmas time. The fact that he spent his free time doing this as opposed to playing Tomb Raider (or whatever the youth play these days) or texting on his phone speaks volumes and should be a lesson to us all. His aim was to not only show people how you can shop cheaply, but to feed as many people as he could. I am all about the coupon. That said, I am also memory challenged and can’t always remember to bring them to the store with me, when I’m out shopping. But the fact that one can get this much food for the unbelievable sum of 4 pence shows that if one is dedicated and willing to put in the time, they can walk away with an obscenely good deal. And of course, giving one’s spoils to charity, especially at this time of year is really what it’s all about. I am praying that I can raise the King with even a fraction of this teen’s generous spirit. At the moment, the King keeps receiving stickers at nursery for helping the little girls on with their coats and wiping their noses (ha!). I figure it’s a small victory, but one’s got to start somewhere. Here’s to giving this holiday season. Hope you have a good one.